27 April 2017 – The European Biomass Conference and Exhibition celebrates this year its 25th edition in Stockholm. With a full agenda of horizontal topics the EUBCE is a key event for the biomass and bioenergy community. A unique platform promoting the transfer of knowledge and expertise among research, industry and policy makers. The EUBCE programme includes this year 1004 presentations, 276 of which are oral presentations, 12 plenaries and 716 visual presentations. An up-to-date programme aims to provide prompt answers to the evolving international policy debate about tackling climate change and giving a glance into the most innovative scientific and technical advances and industry projects. The conference will continue to focus on how to close the gap between research achievements and industrial implementation, given that research in many areas has advanced considerably over the last decade. The conference will tackle from the beginning the "The Indispensable Role of Biomass" as part of the long-term goal agreed in Paris of limiting the increase of global average temperature and bioenergy in the wider bio-economy. Biomass potential, bioenergy policies targets for 2030 and beyond will be part of the debate. The plenary sessions will address some of the major challenges that the biomass community is facing today such as the debate on the perspectives and approaches for bioenergy, the production and utilisation of biofuels and different potential biomass feedstocks, including the organic fraction of municipal waste, the recent findings in the field of thermochemical biomass conversion technologies as well as the challenges and opportunities of establishing bioconversion processes for the bio-based economy. Key approaches for the integration of bioenergy technologies implemented in a flexible manner to provide energy output on demand as well as the latest developments of large-scale industrial plants processing biomass residues and wastes to biofuels and bioenergy will also be presented and discussed. The conference will conclude on how to better "achieve the transition from research to industrial implementation". Important issues will be tackled during the conference, such as biomass production for energy integrated into food and feed farming, integration of bioenergy into a bio-based economy and that of bioenergy with other energy sources. 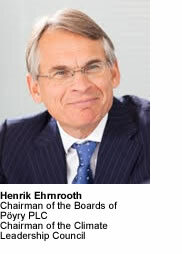 This year for the first time the conference will be co-chaired by Lena Ek (Sweden), President Södra, and Henrik Ehrnrooth (Finland), Chairman of the Board of Pöyry, thereby bringing together the strong and common interests of their two countries in the political support and business opportunities for bioeconomy. Co-chairs, Lena Ek and Henrik Ehrnrooth, bring a wealth of experience to the conference and will ensure an optimum combination of Swedish and Finnish influences in the production and utilization of biomass. The Nordic countries have much to gain and to offer when it comes to boosting the potential of biomass. “Bioeconomy provides opportunities and solutions for some of our global challenges as formulated in United Nations new sustainable development goals (SDGs). The SDGs builds on economic development, social responsibility and environmental considerations. The EUBCE provides a cross-border platform for contacts, knowledge, discussion and solutions”. Lena Ek (1958) is the President of Södra Skogsägarna, an economic association with 50,000 members that together own 36,000 forest farms. Lena Ek will be the first woman to be co-chair of the EUBCE conference. Furthermore, she is also Chairperson of the Board of the Forest-based Sector Technology Platform. Lena Ek has for many years been a leading figure within the political scene in Sweden and Europe and is well respected by all political parties for her in-depth knowledge on the bioeconomy, environmental and economic issues. Before her role as President at Södra Skogsägarna she served as the Swedish Minister of the Environment and Energy while a member of the Swedish Parliament, representing the Centre Party. She has also been a member of the European Parliament, representing the Centre Party. 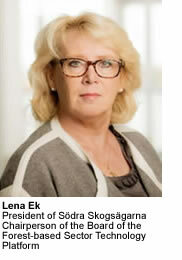 Lena Ek also serves as a Board Member at the Royal Institute of Technology (KTH). "Biomass is the starting point for industrial renewal: recarbonising materials, decarbonising energy is the recipe. This is what EUBCE admirably presents." The quality of the EUBCE programme is excellent, ensured by the Scientific and Industry Committee comprising 140 international biomass experts. In 2016 EUBCE more than 3,700 authors and co-authors from 80 countries around the world were involved in preparing abstracts for contributions. 780 keynote, plenary, oral and visual presentations were held during EUBCE. The upcoming EUBCE will take place from 12 - 15 June 2017 in Stockholm, Sweden.